Los Angeles Dodgers outfielder Yasiel Puig has been named the National League Player of the Week presented for the period ending September 16th. 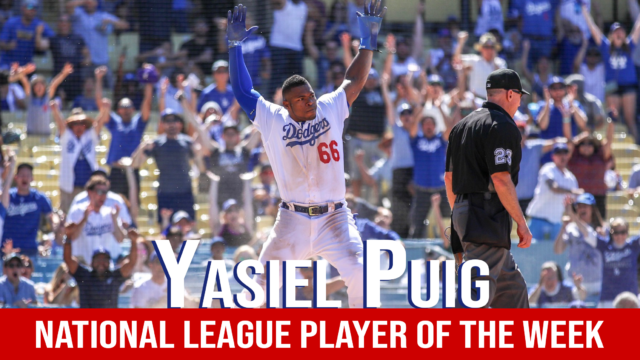 Puig batted .429 (9-for-21) with seven runs scored, a double, five home runs, nine RBI, three walks and a stolen base over seven games played to claim his third career NL Player of the Week Award, last winning for the period ending May 18, 2014. 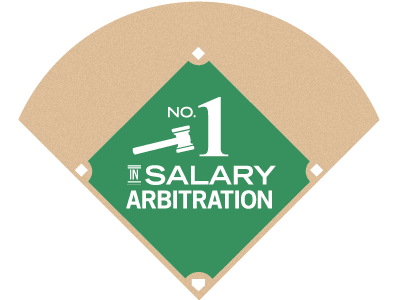 Among his NL counterparts, Yasiel finished the week first in batting average, home runs, RBI, slugging percentage (1.190) and total bases (25); tied for second in runs scored and extra-base hits (6); third in on-base percentage (.500); and tied for third in hits. On Friday night against the St. Louis Cardinals at Busch Stadium, Puig clubbed a pair of solo home runs as part of a three-hit game to lead the Dodgers to an important 3-0 win. The outing was his second multi-homer game of the season, previously doing so on August 2nd against the Milwaukee Brewers. The Cuban native enjoyed one of his best games as a Major Leaguer in the following contest on Saturday, driving in a career-high seven runs to go along with his first career three-homer game. In addition, the dynamic outfielder became just the fourth Cuban-born player to ever reach those totals in a game. Puig became just the ninth player in franchise history to log back-to-back multi-homer games, and the 24th player in Club history to post a three-homer game.